We have been surgically placing dental implants for over 20years. We are available for implant consultations with treatment planning, second opinions, and post-implant evaluations upon request. At consultation, we will answer all of your questions and clearly outline our recommendations for your specific needs. We will work side-by-side with your dentist to achieve your premium dental health. We use Panoramic x-rays and specialized tomographic x-rays and CT scanning for indicated cases to determine whether you are a candidate for dental implants. These radiographs measure the bone height and thickness to determine exact placement of each implant. We practice the most current techniques in implant treatment planning. The doctors work with top restorative dentists in the chicagoland area and northern suburbs. State of the art pre- implant planning procedures are utilized. This includes the use of panoramic radiographs and cross section implant imaging. On-site CMT and Cone beam CT equipment is utilized on select patients. This high tech equipment evaluates the quality and quantity of bone and determines if the patient is a good implant candidate. 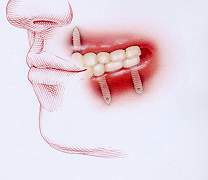 Various state of the art techniques are utilized to place the implants. Computerized implant planning software is available to evaluate the CT scans .